The 240 Series is a high quality, low maintenance line of garage doors designed to add distinction to any home. Experience the look of deeply embossed wood grain with the strength and durability of 24 gauge galvanized steel. The 240 Series offers the look of wood without the worry of warping, cracking, or rotting. The 240 Series carries a Limited Lifetime Warranty as well as a full range of options including glazing, pre-finished color, and window style. Also available is an upgrade to energy efficient insulation with the 241L, 246L, 247L and 248L models. Adding beauty and value to your home has never been so easy. The 240 Series is available in four pre-finished colors. This series includes a three-tier, corrosion-resistant protective finish as well as a heavy vinyl bottom weather seal. This combination of protection seals out the elements and repels the most hostile weather conditions. Optional energy efficient CFD FREE insulation panels offer a calculated R value of 7.25. The 240 Series is also available in a wide range of design pressures for wind load requirements. More window, decorative hardware and color options are available. View your options on the Haas Door website. Download the Haas 240 Series Brochure. 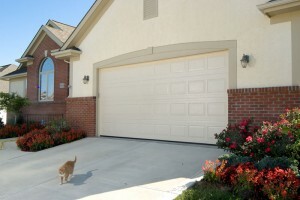 We offer installation for all applications of Residential, Commercial & Agriculture Garage Doors. Replacement parts available for all Residential & Commercial garage door openers including Hand Transmitters & Keyless Entries. We carry the complete line of LiftMaster Operators.